We’d love your help. Let us know what’s wrong with this preview of Beneath The Surface by Heidi Perks. I am a Mom of two adult children. Any mother would find it hard to choose which child to take and which to leave behind, let alone if there were more than two. Why would a Mom abandon one child and take her other two? Leaving a child in despair? You are sixteen and you arrive home. Only to find emptiness. Your Mother is gone and your siblings. Imagine the effect it would have on you. Abbi's therapist suggest she writes letters to come to terms with her feelings. Write them down and see how she feels, her emotions, her love for her family and Mother who abandoned her. Her disbelief. So some of the chapters are written from Abbi's letters. They are heartfelt. There are secrets and lies woven into this story. This is not a thriller of sorts, but it does have mystery. I had to admit that the second half of the story made me cry. The tears flowed at the end. This is a well written book that if made into a drama on TV would get everyone glues to the TV I assure you. In the interest of honesty, I started this book last Sunday week, and up until yesterday I had only read 30-odd percent of it! Fellow bloggers had said they were hooked immediately but that didn’t happen for me at the beginning of Beneath The Surface. However, once I picked it up last night, I couldn’t put it down as I had gotten into it so completely. Heidi Perks has written an excellent novel. It has a very intriguing premise, which sets the main characters and the reader on a quest for answers In the interest of honesty, I started this book last Sunday week, and up until yesterday I had only read 30-odd percent of it! Fellow bloggers had said they were hooked immediately but that didn’t happen for me at the beginning of Beneath The Surface. However, once I picked it up last night, I couldn’t put it down as I had gotten into it so completely. Heidi Perks has written an excellent novel. It has a very intriguing premise, which sets the main characters and the reader on a quest for answers in the book and it doesn’t let up until the very end. As a mother, these kinds of books make me maaaaaaaaaaaad! How on earth could a mother leave? And not only that, take two of her three children with her and leave one behind? It’s unthinkable! Beneath The Surface is an intensely emotional read. I mean, it puts you through the ringer. I spent half of the book totally wound up from the tension. Told in past and present, and from different view points, the reader gets into all of the characters minds which works brilliantly as you get to know so much more about what’s going on. The characters are complex and made even more so as new information comes to light during the course of the book. You cannot help but feel for Abigail; essentially abandoned at 14 when her mother took Hannah and Lauren away never to be seen or heard from again. Beneath The Surface is a lesson in lies and betrayals and the effects they can have on families. It leaves devastation in its wake and the characters all have to pick up the pieces in the aftermath. BENEATH THE SURFACE is the debut mystery/drama/ thriller novel by Heidi Perks. This brilliant novel focuses on the secrets, lies and the complicated relationship between mothers and daughters. drama, dysfunctional families and their effects on. It’s a story of family, betrayal, secrets and manipulation. 2)Her One Mistake -Canadian version-Now You See Her (To be Published Feb 5, 2019) originally published January 8th 2019 BENEATH THE SURFACE is the debut mystery/drama/ thriller novel by Heidi Perks. This brilliant novel focuses on the secrets, lies and the complicated relationship between mothers and daughters. drama, dysfunctional families and their effects on. It’s a story of family, betrayal, secrets and manipulation. I have to admit that while I was fortunate to be recently approved to read her second book, Her One Mistake, I felt I should read her debut novel burning a hole away on my kindle for a while. I don’t know what took me so long to read this author’s work…because her writing is nothing but brilliant! This novel blew me away and had me totally absorbed from beginning to end. One of the BEST novels I have read this year! Her mother, Kathryn disappeared one day. Teenager Abigail Ryder (Abi) is devastated when she gets home from school to find her family gone. Things are missing from the house and her stepsisters, Lauren and Hannah along with their mother are missing. HOW COULD A MOTHER DO THIS? So much emotion in this novel. But the police think she's trouble, and when grandmother Eleanor tells her to forget them all and move on, there's no choice other than face the future - alone. Eleanor is a narcissistic woman, selfish in nature, used to a life of money and power. Kathryn was weak, and Eleanor had a way of manipulating her. This author has a very bright future, and I feel the novel should be made into a movie, as it would be well received. The characters are well developed and the plot is strong. Many thanks to the author and publisher, and now looking forward to starting, book 2, Her One Mistake. Having just finished this book, all I can say is wow! Beneath The Surface is one of those stories that gently draws you into it and then all of a sudden before you know it you are so caught up with the characters that it is impossible to put the book down. I actually read this in one sitting as I had to know why a mother would take two children and suddenly disappear leaving one child behind. It is hard to actually say much about the story itself as I fear I will give parts away and wouldn't want Having just finished this book, all I can say is wow! It is hard to actually say much about the story itself as I fear I will give parts away and wouldn't want to spoil this fabulous story for anyone else. Abi (Abigail) is a character who you can't help but have empathy for. At sixteen to have your mother suddenly disappear with the two youngest children is just unimaginable. It is obvious that Abi has struggled with her life since the disappearance of her family. Abi's parts of the story are actually told through her letters to Adam which is something her therapist has recommended her to do to help deal with her situation. My favourite character has to be Hannah. She is such a strong and independent young lady. The relationship between her and Lauren was just so lovely to read. The closeness between them both is probably not one that many siblings share and I very much enjoyed reading the parts with the girls in. Kathryn I have to admit to never warming to. She is such a weak character and as a mother as well as a daughter, I could not relate to her at all. Beneath The Surface is a story that is filled with secrets and lies. I really did not see certain things coming and it just enthralled me in the story even more. The second half I found quite emotional in parts and at the end I couldn't stop the tears from flowing down my face. This review was originally posted on [Between My Lines]Books about secrets! I can’t resist them. So when I read the synopsis for this one and saw it was about a family that disappeared out of Abigail’s life, I was so curious and I had to see just what happened. I’m always a bit fascinated by missing person cases as all the This review was originally posted on [Between My Lines]Books about secrets! I can’t resist them. So when I read the synopsis for this one and saw it was about a family that disappeared out of Abigail’s life, I was so curious and I had to see just what happened. I’m always a bit fascinated by missing person cases as all the “what-ifs” and “maybes” just feed my insatiable curiosity. And the setting for this book is even more mysterious as the whole family just up and vanish, along with their belongings. So you feel it is very carefully orchestrated but why did they leave seventeen year old Abigail behind? The story is told over two different time settings – the time of the disappearance and fourteen years later. It’s all very mysterious and dark as it focuses on mental health issues, family cover ups and dysfunctional relationships. I found I guessed the secret very early on but it didn’t matter in the slightest as I was waiting for the inevitable confrontations to happen and my heart was beating in anticipation. I also really appreciated how well fleshed out the characters were. Both the likeable ones and the unlikable ones. I could feel sympathy for one of the characters but I also thought her weak and my sympathy never developed into forgiveness. The characters were written with empathy and that made me care about them. I found myself thinking about characters when I wasn’t reading and in particular wondering just what I would do if I was Abigail. And ultimately, I loved the conclusion. It felt satisfying and authentic and I just know that it was a choice I would have made too. I really appreciated how much this book drew me in and I know for sure I’ll be reading more by Heidi Perks in the future. Who should read Beneath the Surface by Heidi Perks? I’d highly recommend this to you if you enjoy themes of secrets and lies within family settings, complex multi-layered characters and lots of moral dilemmas to discuss. For this reason too I think it would make a great book club read as there are plenty of issues to trash out! Wow. What a ride. Sumptuously told, delivered in the most enthralling of ways, Beneath The Surface by Heidi Perks absolutely blew me away. Hooked from page one, it was impossible for me to put this novel down, and in all honesty I didn't want to, and couldn't have even if I had wanted to. The mystery and secrets teased and taunted me towards the moment of reveal and, throughout the pages I became entranced by the story being told to me. Focusing on drama, rel Originally reviewed on Becca's Books. Wow. What a ride. Sumptuously told, delivered in the most enthralling of ways, Beneath The Surface by Heidi Perks absolutely blew me away. Hooked from page one, it was impossible for me to put this novel down, and in all honesty I didn't want to, and couldn't have even if I had wanted to. The mystery and secrets teased and taunted me towards the moment of reveal and, throughout the pages I became entranced by the story being told to me. Focusing on drama, relationships driven by power and the bonds running deeply within a family, Beneath The Surface by Heidi Perks was a perfect read for me, and I'd highly recommend this to readers who enjoy a twisting novel packed with the ability to keep you guessing. Heidi Perks opens Beneath The Surface in the most brilliant of ways and throughout, takes readers back and forth to different sections of times, slipping between characters and providing the reader with a view from all angles. Abigail is introduced to us first and, during the opening scene, it's revealed that her mother has upped and left without a last word, taking Abigail's two young sisters with her. With no explanation as to their whereabouts and why they've left her behind, Abigail is left questioning everything and everyone. I couldn't believe that her mother had left Abigail in such a tragic way, but as Heidi began to reveal the oddities of Kathryn to me, I began to realise that perhaps it hadn't been so odd for her to have left like that after all. For the first couple of chapters, the author ensured I was kept deliciously dangling as I waited for more details of this rather bizarre family to become clear. I wanted to know everything and thankfully, Heidi delivered. Through the form of letters and flashbacks, each character's past was built up brick by teasing brick and I couldn't wait for the picture to appear to me, fully-formed. I adored the way Heidi told this story, it really couldn't have been done in a more effective way. It had such a hold over me I couldn't bear to look away for even a single second, terrified of missing a pinnacle moment for all of the characters involved. The characters within Beneath The Surface by Heidi Perks were a puzzle all of their own. Eleanor, Kathryn, Peter, Abigail, Hannah and Lauren were so complex and intricately put together, I was incredibly interested by each of them in their own right and for different reasons. It became clear part-way into the novel that Heidi Perks had a brilliant knack at having her characters make me feel a certain way. For instance, Eleanor came across as very cold and conniving to me. Kathryn incredibly meek, nervous and unsure of everything and everyone. The twins, Hannah and Lauren, seemed like your typical teenage girls but the differences between them were clear in how they acted. Hannah was certainly the more adventurous of the two, whereas Lauren didn't like to push the boundaries too far. And Abigail, having lived a past like she had, had been through such a lot and I only hoped that she'd find her way. There was so much emotion within this novel. So much hope, but at the same time hopelessness. It took me on such a whirlwind of a journey, I almost couldn't believe how easily I allowed myself to be led by the author. There were moments of shock and disbelief, moments of my mind trying to jump ahead excitedly to try and figure out how everything would end. It was such a thrilling read, I'm jealous of anyone who gets to read this for the first time. I really am. The plot itself was punchy and sharp, one where I found something new to anticipate with every new chapter. How the past and the present came to meet was incredible and I felt truly in awe of what Heidi Perks had achieved with her characters and their stories. The whole truth and nothing but the truth was delivered to me, it only made me read the remainder of the book quicker and with even more vigour. I could not get enough and really didn't want the story to end. Despite the amount of information packed into this book, Heidi Perks didn't miss a single trick. She ensured her characters were solid people, people who felt so real to me I could hardly believe they were fictional. The consequences of the past came to light in the present day and it was done so spectacularly, I was left reeling and breathless. All in all, this was a tremendous novel for me to get lost in. It consumed and toyed with me, in the way only a brilliant story can do. My mind was constantly full of these characters and their lives, and the need to continue repeatedly tugged at me. It was mysterious, overwhelming and utterly addictive. I, for one, cannot wait for whatever Heidi Perks brings to the table next. I sincerely hope I don't have to wait too long. She is definitely an author to keep an eye on. Me ha gustado, me ha mantenido en tensión al ir descubriendo paulatinamente la vida de la familia protagonista, cuando Abi intenta encontrar y saber los motivos por los que un día, al llegar del colegio, toda su familia se había ido. Alterna capítulos en los que Abi escribe cartas como terapia, explicando su infancia y adolescencia; con capítulos en el momento actual de la vida de su madre y hermanas. Beneath the Surface was an interesting read however, I am still unsure as to whether I enjoyed it. The tale is told from three perspectives: the mother (Kathryn), her twin daughters (Lauren and Hannah) along with her eldest daughter (Abi) and, I suppose what annoyed me the most was the use of Kathryn's name by her daughters and the use of Eleanor's name rather than mum or grandmother as, this limited the books authenticity. I understand it was done to reduce confusion but honestly I wasn't a fan. Beneath the Surface was an interesting read however, I am still unsure as to whether I enjoyed it. The tale is told from three perspectives: the mother (Kathryn), her twin daughters (Lauren and Hannah) along with her eldest daughter (Abi) and, I suppose what annoyed me the most was the use of Kathryn's name by her daughters and the use of Eleanor's name rather than mum or grandmother as, this limited the books authenticity. I understand it was done to reduce confusion but honestly I wasn't a fan. Why would a mother abandon one of her children? 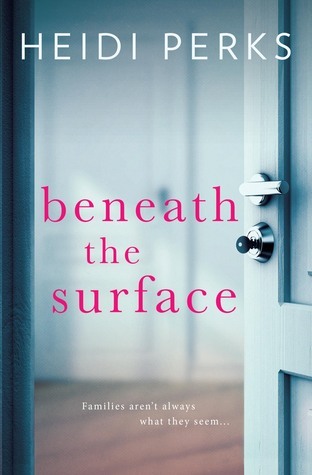 Beneath the Surface is an intriguing novel about secrets, lies and the complicated relationship between mothers and daughters, with a dark mystery at its heart. Divorato in un giorno e mezzo! Un bel thriller che ricorda un po' "Piccoli grandi bugie" per gli intrighi e la storia di amicizia tra le protagoniste. Non ti annoia mai e devi assolutamente continuare a leggerlo, esattamente quello che ti aspetti da un buon thriller! Every now in then a novel comes along and takes my breath away, and Beneath The Surface fits the Bill perfectly. It’s an emotionally charged thriller that kept me enthralled until the last page. It’s a story of Family, betrayal, secrets and manipulation. Beneath The Surface opens with a hell of a tale, teenager Abigail Ryder arrives home from school one day to find her family gone. How could a mother leave her child? Or worse take two daughters with her and leave one behind? These were questions Every now in then a novel comes along and takes my breath away, and Beneath The Surface fits the Bill perfectly. It’s an emotionally charged thriller that kept me enthralled until the last page. It’s a story of Family, betrayal, secrets and manipulation. Beneath The Surface opens with a hell of a tale, teenager Abigail Ryder arrives home from school one day to find her family gone. How could a mother leave her child? Or worse take two daughters with her and leave one behind? These were questions I kept asking myself throughout the book, which made for an intriguing and compelling read. Fast forward 14 years and we meet Kathryn the mother and her 16 year old twin daughters Hannah and Lauren,who are living in a small seaside town, at this point we are also introduced to the matriarch of the family Grandmother Eleanor who is now in a care home suffering with dementia. The story is told from three perspectives The mother, the twin sisters and Abi whose story is told in letters to her husband Adam, as suggested by her therapist. Through these letters the reader is drip fed snippets of the events leading up to Abi being abandoned, which make for a riveting read. The characters could win an award for “the most dysfunctional family ever” a controlling and manipulative grandmother, a mother who suffers from a mental illness and an abandoned daughter. I found myself totally wrapped up in them, that doesn’t mean I particularly liked some of the characters, in fact I really disliked Eleanor and Kathryn. Eleanor came across as a narcissistic, controlling and a very manipulative mother and grandmother, where Kathryn appeared weak and shallow, controlled by an over domineering mothers mother who would do anything to please Eleanor even if it meant putting her own family second. As for Abi my heart ached for her, imagine being abandoned by your whole family? How would you feel? Her devastation and bewilderment at being abandoned was tangible throughout. Hannah and Lauren are very likeable characters and I felt such compassion for them, being bought up by an overbearing mother, who constantly puts them second in her bid to please Eleanor. As Beneath The Surface unfolds, so do family secrets, secrets that shocked me to the core! I never seen them coming until they hit me in the face. Heidi Perks manages to keep the momentum going until the very last page, and I was so engrossed in it I struggled to put it down and read it in just over one sitting. This is the debut novel from Heidi Perks, which I find difficult to believe due to her delivering an exceptional novel, with multi dimensional characters, and an original and well thought out plot. I would not hesitate in buying the authors next book, and I will be recommending this book to everyone I know. Fourteen year old Abigail Ryder arrives home from school one afternoon to find that her mother & twin baby stepsisters are gone, things are missing from the house and the babies room is completely empty but none of this makes sense to Abigail. She contacts the police and as she's been interviewed they think that she's a troublemaker and their suspicions are confirmed when her grandmother Eleanor arrives to the house and has a word with them. Then her grandmother tells her to forget them all and move on, there's no choice other than face the future - alone. Beneath The Surface was brilliant! It was completely unpredictable from beginning to end and I love how Heidi managed to write a story that feels very different and fresh from a lot of other novels out there at the moment. It was thrilling but in a whole new way and was laced with mystery and enigma that had me glued to the pages. Beneath The Surface tells the story of Abi who gets home from school one day to find her family have gone and left her behind; where are they?! Why didn't they take Ab Beneath The Surface was brilliant! It was completely unpredictable from beginning to end and I love how Heidi managed to write a story that feels very different and fresh from a lot of other novels out there at the moment. It was thrilling but in a whole new way and was laced with mystery and enigma that had me glued to the pages. Beneath The Surface tells the story of Abi who gets home from school one day to find her family have gone and left her behind; where are they?! Why didn't they take Abi with them? The story then flashes forward about fifteen years and we see where Abi is now and what happened to the family who left her behind. This was a very clever and well told story that threw many curveballs at me from the beginning. Heidi explores lots of different issues in this novel too that she dealt with well. Her characters are, for the most part, believable. There were lots of mixed emotions in this book; I found myself feeling angry one minute and then sympathetic the next which was a great reading experience. I like it when an author makes you change your mind about a character a lot! Sometimes you find that rare book that has you hooked from the very first page - 'Beneath the Surface' does exactly that. It lures you in and just doesn't let you go. Perks really has an ability to get you on board from the very first chapter which is something of a rare occurrence. The storyline is intense and never ending (in a good way!). The amount of twists and turns that Perks has managed to incorporate in to this story is incredible and I really am so impressed with her imagination! In a way 'Beneath the Surface' is quite haunting - by this I mean that Perks has really gone to the extremes with the trials and tribulations of family life. The skeletons in this families closet is shocking and Perks really keeps you wanting more from them. It was so beautifully written, yet it is such a tragic, heartbreaking story. The ending broke my heart but it fit perfectly. I will definitely read more of the authors books. She writes beautifully. Beneath The Surface plays its cards incredibly close to its chest as it poses disastrous dilemmas for one family under the microscope. Step into the shoes of a seventeen year old girl with a whole lot to say for herself, who left the house one morning only to return to an empty one. Her mother and her two year old sisters weren’t home, and as time went on it appeared they had no intention of ever coming back. Unfortunately, this stuff of nightmares happened to Abigail. At first she didn’t could quite understand the bizarre situation she found herself in. She knew she had a difficult relationship with her mother, but surely this was a punishment too far? Surely she couldn’t hate her so much to up and leave without telling her? When realism finally kicked in Abigail called the authorities and reported her family missing. The only assistance she received was from her narcissistic grandmother who arrived on the scene to take control, just like she with everything else. Her future became dominated by that day. As a young girl without stability or guidance and only her grandmother throwing money at her, she was condemned to make one bad decision after another. Over the course of fourteen years Abi carried the burden for the loss of those she cared for. She couldn’t even tell all of the facts to her husband, Adam, placing their own relationship under a significant strain. As she struggles to piece together the puzzle of her life her therapist, Maggie, suggests she put pen to paper and vent her emotions by writing a letter to Adam. This may bring clarity to her life, even though both he and her family are not currently part of it. The letter carefully reveals tiny snippets of Abi’s past and increases the suspense at a perfect pace. You just can’t help being intrigued as to what on earth transpired, compelling you to read on! The remaining story is told from scenes that are happening in an obscure seaside village, where there’s a family facing a few trials of their own and the suspense is steadily rising. But more significantly there’s an elaborate lie that’s so huge it’ll smack you right between the eyes – heck, my reader radar didn’t see that one coming! There were a few moments that left me, well, pretty gobsmacked if I’m honest! The entire story revolves around the choices we make and how they affect others, even if we can’t see it at the time. With unimaginable spite emanating from a matriarchal shrew, the placating reactions of those tip-toeing around her, and the ignorance toward the subtle hints of mental illness, the drama is SO well played. The constant state of wondering whether Abi will ever find the answers she’s looking for keeps the tremendous tension simmering throughout. Yep, it’s very well played indeed. What sort of mother could possibly disappear one day, taking her twin toddler daughters with her, but leaving behind her teenager? What sort of grandmother tells the teenager to forget about her family and just to move on with life? And how does the teenager ever rebuild her life. 14 years later everything for this family is about to unravel and its a fascinating journey to discover the truth behind that day. Well that is what happened to Abigail and the chapters focusing on her story, are writt What sort of mother could possibly disappear one day, taking her twin toddler daughters with her, but leaving behind her teenager? What sort of grandmother tells the teenager to forget about her family and just to move on with life? And how does the teenager ever rebuild her life. 14 years later everything for this family is about to unravel and its a fascinating journey to discover the truth behind that day. Well that is what happened to Abigail and the chapters focusing on her story, are written as letters from Abigail to the lost love of her life, as she tries therapy and attempts to get to the bottom at last of what happened when she was younger. Then there is Kathryn who is the mother in question, and she has a questionable personality. As we learn about her childhood, I couldn't help but feel sorry for her in places, but yet as an adult I really disliked her. And Kathryn's mother Eleanor is just trouble. She is a woman whose top priority appears to be appearances and what other people would think. And then there are the twins, who are definitely the innocent party in all that went on in the past, but its interesting to see how those events have shaped them as teenagers, and just what sort of parent Kathryn has become. I was intrigued by the start as like Abigail I was wanting answers as to who could do that to her. I found the book gripped me early on so that I had no idea where abouts on my commute I was, and then as it proceeded I was loving the various twists, turns and secrets that were unveiled. This kept me on my toes and made me want to continue to turn the pages until I ran out of them. I found all the characters individually came across very realistically, but the storyline itself could be regarded as a bit far fetched, however when its that interesting, I don't really mind. Beneath the Surface is an impressive debut novel, and one that I am very glad was brought to my attention. The book starts with a short introduction from 14 years ago in 2001 when 17 year old Abigail finds that her mum and 2 year old twin sisters have disappeared from their London home. We then move forward to 2015 and introduce the rest of the main characters. The twins Hannah and Lauren, now aged 16 are living with mum Kathryn in Mull Bay, unaware of Abigail’s existance. Grandmother Eleanor is in a care home suffering from dementia. Abigail’s husband Adam wants a baby, but Abigail is secretly still o The book starts with a short introduction from 14 years ago in 2001 when 17 year old Abigail finds that her mum and 2 year old twin sisters have disappeared from their London home. Abigail’s husband Adam wants a baby, but Abigail is secretly still on the pill. Adam books them an appointment to see a fertility doctor. Things spiral from that point on and Abigail tells her past in the format of a letter to Adam. She also wants to find Hannah and Lauren. Meanwhile we see how unable Kathryn is at making decisions for herself, always relying on her mother. For instance, Hannah wants to know who her Dad is, a question Kathryn can’t cope with. As a reader, I could tell we were heading for everything to collide, but there were plenty of interesting twists. And I needed my box of tissues when I reached the end. I won’t say any more, so as not to spoil it for you. I loved this book and highly recommend it, Looking forward to Heidi’s next novel. I feel bereft. After a week with my new friends Abigail, Hannah and Lauren, I had to say goodbye to them tonight. I'm sure that Abigail felt far worse when she came home and found her two year old sisters and mother were missing, but the characters were so brilliantly developed and their story so well told I feel I have been part of their lives too. I felt their pain, their confusion and understood the conflict and control they were dealing with. Fantastically crafted story telling, that transpo I feel bereft. After a week with my new friends Abigail, Hannah and Lauren, I had to say goodbye to them tonight. I'm sure that Abigail felt far worse when she came home and found her two year old sisters and mother were missing, but the characters were so brilliantly developed and their story so well told I feel I have been part of their lives too. I felt their pain, their confusion and understood the conflict and control they were dealing with. Fantastically crafted story telling, that transported me from a gloomy forbidding house in Yorkshire to almost smelling the sea air on the shoreline. Yes the twist had me like other reviewers fooled too. Why would a mother ever leave a child behind? Beneath the Surface is a gripping thriller that follows Abi in her quest to find the truth behind why her mother left her alone yet took her twin sisters with her. Heidi Perks is a fantastic writer and I read this book in one sitting. The novel is packed to the brim with secrets following Abi up to the present day when she may finally have a chance to confront the mother who abandoned her. Every once in a while there's a book that appears in the post that just blows you away, and this is definitely one of them. From the beginning the author draws you in, dangling the mysterious plot of a mother walking out on one of her children and taking the two youngest ones with her, and the one left behind has no idea why or where her family has gone. It's compulsive reading, the need to find out why teenage Abi was left to fend for herself by her mother is strong. I won't lie, my maternal in Every once in a while there's a book that appears in the post that just blows you away, and this is definitely one of them. I won't lie, my maternal instincts kicked in at this point, I felt I wanted comfort Abi and pull her into a motherly embrace. The abhorrence at what her mother had done was palpable and incomprehensible. I needed to find out why. Abi's struggles to come to terms with what happened are cleverly detailed in the form of letters to her husband Adam. Her therapist Maggie advised her that this might be a good way to get out how she feels about what has happened between her life before Adam and where she is now. As she recounts the tale of her life up to that point it's difficult not to feel some compassion towards her. The irreparable damage to her mental state and her trust issues are so deeply rooted because of that disappearing act fourteen years ago. As the story develops, things become less clear, characters evolve and you begin to see things from other points of view. The narration from Abi's mother Kathryn was particularly interesting. She was a well portrayed character, incredibly meek and highly anxious. Her mental health definitely seemed questionable at times, the girls often mentioning about her being in a constant state of anxiety or unease about things. The controlling influence of her mother Eleanor was too much for her to bear, and the constant need for approval from her mother was definitely heartbreaking to read. Whilst this story was about secrets, lies, families and betrayal, there as a lot of emotion in this too. For a writer to create characters that you could feel an absolute loathing for, ones you desperately wanted to comfort and ones you wanted to take and shake some sense into is a mark of good writing. Weaving such a delicate issue into a wonderful story like this is also brilliance, for some people, the idea of a mother abandoning a child is a step too far, but this was well handled throughout. In fact, all of the sensitive issues involved in this story were well written and thoughtfully detailed and for that I applaud the author. The characters were all well detailed, and three dimensional (even the flawed Kathryn), they appeared very lifelike and believable. The writing is superb, detailed and well researched, the skill at maintaining the suspense and intrigue throughout really means that Heidi Perks is a name you want to look out for in the future. It's the sort of story that stays with you after you've read it, almost making you wonder what you would do in that situation. This was an all consuming and compulsive read, I would have no hesitation in recommending it to others. This is only the second book that I've read which falls under the 'mystery' category and I really don't know why I haven't started in this genre sooner! I think it can be tricky to find the perfect formula for a mystery novel, as the story needs to keep the reader wanting to discover more, without unnecessary taunting by withholding information whilst also ensuring that the story is believable. From the first page of Beneath The Surface, I knew that this book was going to be a favourite of mine. This is only the second book that I've read which falls under the 'mystery' category and I really don't know why I haven't started in this genre sooner! I think it can be tricky to find the perfect formula for a mystery novel, as the story needs to keep the reader wanting to discover more, without unnecessary taunting by withholding information whilst also ensuring that the story is believable. From the first page of Beneath The Surface, I knew that this book was going to be a favourite of mine. One of the first things I noticed was the uncomplicated, clear manner of writing that Perks uses to explain a situation which is actually quite complex and intense. I was instantly able to relate to the main character, Abi, and loved the descriptions of British mannerisms, locations and experience of being a teenage girl. Abi comes home from school one day to find her mother and two younger sisters have disappeared, leaving her confused and alone with only a controlling and unfriendly grandmother to act as a family connection. The story is told first through Abi's perspective, then alternates between her mother, Kathryn, her younger sister, Hannah and Abi herself in the form of letters written to her husband. As the story progresses, it becomes clear that the reason for Kathryn's disappearance from Abi's life has many layers which are gradually revealed and add another piece to the puzzle of Kathryn's act, until it all starts to come together. I really loved this element of the book, and didn't feel the need to skip parts of the book to reach the conclusion as the journey felt so poignant. Some key thoughts that lingered with me after reading this book were mainly centred on family values, the role of a mother and mental health. As the reader you journey with Abi and Hannah as they try to reveal the secrets that have affected them and also follow their mother, Kathryn, as she desperately tries to keep a hold on the situation, as well as her own mental well being. The notion of motherhood is explored in depth throughout this book, and shows how crucial the role of a mother can play in a child's wellbeing and ability to act as a good mother themselves. After initially disliking Kathryn, I gradually came to understand her actions and behaviour which had been so greatly affected by her own mother. I feel that there was a delicate balance between the tragic and hopeful events in Beneath The Surface, and I will be recommending it to a number of friends and family members purely for the enjoyment I know they'll get from trying to piece together the clues of this mystery. I had heard so many great things about this book that I jumped at the chance to read it. I can see why people absolutely love it, but I’m afraid I didn’t so much. Don’t get me wrong, it’s a great read and I did enjoy it. It was just missing something for me (when I work out what ‘something’ is I’ll let you know). I’m still umming and ahhing over my star rating, hopefully I can decide before I reach the end of this review! Abigail, a sulky teenager, returns home one day after school to find her mo I had heard so many great things about this book that I jumped at the chance to read it. I can see why people absolutely love it, but I’m afraid I didn’t so much. Don’t get me wrong, it’s a great read and I did enjoy it. It was just missing something for me (when I work out what ‘something’ is I’ll let you know). I’m still umming and ahhing over my star rating, hopefully I can decide before I reach the end of this review! Abigail, a sulky teenager, returns home one day after school to find her mother and twin sisters have packed up and left. Where? She has no idea. Luckily her grandmother, Eleanor, is on hand to explain the situation to the police and calm everything down. She hands Abi a wodge of cash and tells her to get on with her life which Abi does with the aplomb of a teenager; drink, drugs, nightclubs. Before long Abigail has moved on with her life, but something is missing. She makes a disastrous decision which leaves her painfully alone. Deep down she knows what she needs to do, and that’s find her twin sisters. Fourteen years have passed but she knows it won’t be easy. Secrets and lies rule her family, they are interwoven into the very heart of it. She couldn’t find them then, does she have any hope of finding them now…? The story is told from three perspectives; Abigail, her mother Kathryn and the twins, Hannah and Lauren. I couldn’t stand Kathryn. It’s been a while since one character in a book made me feel such repulsion and disgust. Granted, there were other things going on with her but aaarrggghh…I wanted to shake her. The obvious villain, Eleanor, didn’t register anywhere near Kathryn on my ‘I don’t like this character’ scale *shudder*. Abigail’s story is told in the form of letters to her husband, Adam. I found this a clever way of bringing further layers into this dark story. Abigail and the girls are well written and I did warm to all three; maybe less towards Lauren but I think that is what Heidi Perks would want. I loved Abigail’s feistyness, particularly during one scene towards the end of the book (can’t say anymore without spoilers). I was cheering Abi on and was incredibly pleased when the scene ended the way it did. I’m afraid to say I did find Beneath The Surface a little obvious in places. Saying that, I still enjoyed the book – I just gave myself a little pat on the back for spotting what was coming! The story flows well and I was engaged throughout. It’s well written and I liked Heidi Perks’ style. I would definitely read more of Heidi’s work. Would I recommend this book? I would, but for me it lacked pizzazz. I think I wanted a little more oomph but can’t begin to tell you how or where that oomph needed to be! After some intense pondering I have come to the conclusion that Beneath The Surface and I just weren’t a good match. It’s a great book, it just wasn’t for me. Beneath the Surface by Heidi Perks has one of those blurbs that just make you need to read the book because you just have to know what happened, it poses so many questions that need answers. What kind of mother leaves a child behind? How did this affect Abi? Did it affect the twins growing up? What kind of grandmother tells you to forget your own family? My head was spinning with questions and the more I read of this book the more complex and utterly brilliant it becomes as the answers begin to Beneath the Surface by Heidi Perks has one of those blurbs that just make you need to read the book because you just have to know what happened, it poses so many questions that need answers. What kind of mother leaves a child behind? How did this affect Abi? Did it affect the twins growing up? What kind of grandmother tells you to forget your own family? My head was spinning with questions and the more I read of this book the more complex and utterly brilliant it becomes as the answers begin to be revealed the more I just had to keep reading. The story begins in 2001 when seventeen year old Abi arrives home one day to find her mother and stepsisters and all their belongings have vanished. Where have they gone and why? Abi is devastated when her grandmother tells her it would be best for her to move on and forget them, but how can you do that? Fourteen years later and Abi needs some answers as the only way forward is to embrace the past and work out the truth. What I loved most about this book was that we get to hear about events from a number of perspectives as we have narrative from Kathryn, Hannah, Lauren and Abi with snippets from Peter and Eleanor. Abi’s narrative is particularly moving as it’s told through letters to her husband Adam and it’s very emotional and its obvious Abi has not had an easy life, even before her mother’s disappearance. Despite being so many characters and point of view they all fitted together to form a cohesive story with had me gripped until the very end. Each of the characters had their own personalities to distinguish them, making them feel very real. Some of them I liked, some I didn’t. Eleanor was very controlling and driven, showing no real emotion towards any member of her family and I just didn’t like her. Kathryn I found to be weak and I so wanted her to be strong and make her own decisions. Abi was just longing to belong and find some love from somewhere. The twins Hannah and Lauren couldn’t be more different, Hannah longs to escape the clutches of her family and experience the world away from the bay, whereas Lauren is happy to plod along following the rules and trying to keep the peace between her mother and Lauren. Beneath the Surface is a novel full of secrets, with more being unravelled in every chapter, it’s full of twists and unexpected surprises which had me completely hooked. I loved everything about this book the complex characters, the secrets, the way everything came together at the end. I want to thank Heidi and her publishers for sending me a copy to review, I loved this book and think Heidi has done a fantastic job writing her debut novel, I really hope there’s more to come. I’d like to rate Beneath the Surface 5 out of 5, it was just brilliant! There was no hanging around in this book as we are transported back to 2001 and immediately plunged into the drama when Abigail returns home from school to an empty house. A house that is normally bubbling with the excitement and chatter of Abigail's two year old twin sisters, Hannah and Lauren. As Abigail makes her way through the house in search of her mother and sisters, she makes a startling discovery; the twins' room has been stripped bare and, apart from a stray teddy that seems to have be There was no hanging around in this book as we are transported back to 2001 and immediately plunged into the drama when Abigail returns home from school to an empty house. A house that is normally bubbling with the excitement and chatter of Abigail's two year old twin sisters, Hannah and Lauren. As Abigail makes her way through the house in search of her mother and sisters, she makes a startling discovery; the twins' room has been stripped bare and, apart from a stray teddy that seems to have been overlooked, there is no trace that her little sisters were ever there at all. Where has Abi's family gone? What kind of mother would leave her daughter? Why does her strange, controlling grandmother not help Abi? So many questions were flying round my head as I tried to unravel the mystery surrounding the disappearance. All of my questions were answered superbly after I was shocked, surprised and moved to tears as the story unfolded 14 years later in 2015. Hooked does not even begin to describe how I felt about this book. From the opening page, I was drawn into the tangled web of Abigail's life. I couldn't put the book down until I found out what on earth had happened to make a mother leave her eldest daughter behind and start a new life with her young twins. Also throughout the book, Abi is writing letters to her husband, Adam. It is clear that Abi and Adam are having some marital problems, due to events that Adam is unaware of in Abi's past. The letters are so poignant and personal that I felt like an eavesdropper as Abi's heart is poured out on the page. I was so emotionally invested in this book that I could barely read through my tears as the story drew to a close. I was so completely immersed in Abi's life that I wanted to keep on reading about her long after the final page had been turned. Beneath the Surface is an absolutely outstanding debut novel from Heidi Perks and I can't wait to see what she has in store for us next. Imagine being sixteen and coming home from school to find that your mother and baby stepsisters have disappeared from the family home, leaving no trace of where they might have gone. Trying to make sense of this disappearance would be beyond the comprehension of most people and for Abigail Ryder the devastating truth of abandonment is something that will shadow her throughout the rest of her adolescence and early adulthood. After the initial disappearance we meet up with Abigail some fourteen yea Imagine being sixteen and coming home from school to find that your mother and baby stepsisters have disappeared from the family home, leaving no trace of where they might have gone. Trying to make sense of this disappearance would be beyond the comprehension of most people and for Abigail Ryder the devastating truth of abandonment is something that will shadow her throughout the rest of her adolescence and early adulthood. After the initial disappearance we meet up with Abigail some fourteen years later when she partnered with Adam and they are considering having a family of their own, and that’s when the past in all its frightening reality comes back to haunt Abi. The intervening years haven’t been without incident for Abigail’s mother and younger sisters and the story of what happened to them forms a good percentage of the story. This tightly drawn suspense story grabs your attention from the beginning and what then follows is a cleverly constructed psychological profile of a family at odds with themselves, who are so full of secrets and lies that it’s difficult to know exactly where the truth is going to come from. It’s quite an emotional read in places, and the convoluted relationship between mothers and daughters becomes as much the focus of the story as the story itself. To say more would be to spoil the impact of the story and that would be such a pity as the story should be read with no spoilers from me. The overarching themes of the book are love, loss, pride, and family values. Family is the key that holds the story together, so it's quite ironic when you read it and see just how dysfunctional our main characters are. Without giving too much away, the whole family pivots around one significant family member, who triggers a series of events leading the characters to where they end up. I found the plot as a whole to be quite far-fetched, and at times certain events or character's behaviour seemed a bit unrealistic or even forced, but I was able to see past these obstacles as it was so gripping I had to keep reading! The beginning of the book sucked me in instantly. By the end of the first chapter, I was hooked. The author has crafted the story in such a way that little clues as to why things happened as they did are dangled in front of the reader like carrots for a donkey, encouraging us to read on. This is not a thriller by any means, but it bears the hallmark of the classic thriller clues throughout the whole story. There are a number of big twists in the plot, and it must be a credit to the author that I didn't spot any of them coming! Each new twist and turn in the story took me by surprise, guiding and shaping the story to the end point which, again without giving too much away, hit my emotions like a ton of rocks. If you read this book and don't cry at the very end, you must have emotions of steel! Heidi successfully applied for a place on the inaugural Curtis Brown Creative online Novel Writ Heidi Perks was born in 1973. She lives by the sea in Bournemouth with her husband and two children.